CHICO, Calif. — President Trump and one of his toughest critics, California Gov. Jerry Brown (D), tamped down political conflagration yesterday to focus on dealing with the state's catastrophic wildfires. Trump put himself at odds with California officials and scientists over the weekend by blaming the state's forest management policies for the fires and threatening to withhold federal funding. "There is no reason for these massive, deadly and costly forest fires in California except that forest management is so poor. Billions of dollars are given each year, with so many lives lost, all because of gross mismanagement of the forests," the president tweeted Saturday. "Remedy now, or no more Fed payments!" Brown pushed back in a press conference Sunday, tying the fires to climate change. "The chickens are coming home to roost," he said. "This is real here." Yesterday, Trump and Brown spoke on the phone and apparently smoothed over their differences. "He's pledged the full resources of the federal government, and I can tell you California stands in the same position," Brown said. "I think now is the time for solidarity and understanding, and let's learn how to do this together in the best way we can and get ready, because we're always under some kind of threat." Trump toned down his rhetoric, as well. "Just spoke to Governor Jerry Brown to let him know that we are with him, and the people of California, all the way!" he tweeted. 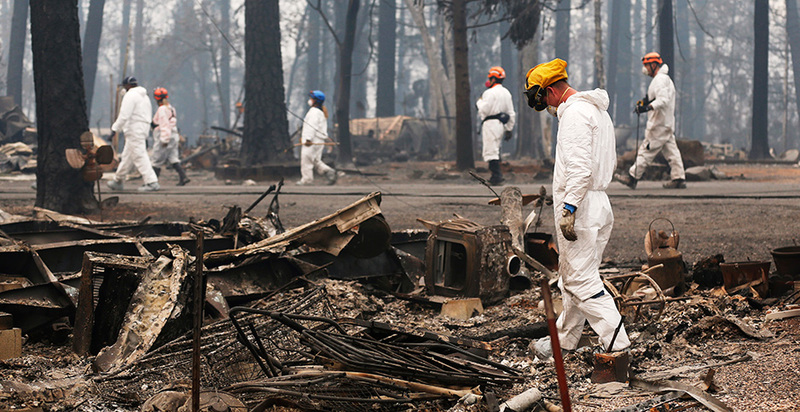 The Trump administration issued a major disaster declaration Monday for counties affected by the deadliest burn in state history, while Brown issued an executive order yesterday aimed at expediting cleanup, shelter and rebuilding. In Chico, where the local fairgrounds were turned into an incident command post for the state and federal agencies fighting the Camp Fire, Brown and Interior Secretary Ryan Zinke were similarly diplomatic yesterday. The Camp Fire, which started Nov. 8 about 80 miles north of Sacramento, has burned 135,000 acres and is the deadliest and most destructive wildfire in state history. It has killed at least 56 people and destroyed an estimated 7,600 homes. Appearing together here yesterday in the smoky air, Brown explicitly cited climate change as a cause, while Zinke spoke of rising temperatures but steered clear of using that phrase. Scientists have pointed to extra-dry vegetation, caused by California's drier-than-normal fall, as a "threat multiplier," but also cite increased populations living in urban areas and near forests (Climatewire, Nov. 13). "We're in a different kind of world, we know that," Brown said yesterday. "There are many elements to this, what causes these kinds of catastrophes: where people live and how they live and structures and changing of the climate, the winds, the dryness, all the rest of it." Zinke partly attributed the increased destructiveness to longer fire seasons and rising temperatures, but he didn't mention climate change explicitly. "As Gov. Brown has said, there's a lot of reasons for fire," Zinke said yesterday. "Why we're here. Some is that fire seasons have gotten longer, the temperatures have gotten hotter, the amount of material, the dead and dying timber, is elevated. You had a mortality rate of the beetle kill. ... I don't want to finger-point; what I want to do is how do we go from here?" Zinke acknowledged a reporter's point that about half of the 1.6 million acres burned in California this year have been on federal land. "The president has pledged full support to California, but you are right — this is just not a state issue, it's not a federal issue; this is an American issue of managing our forests," he said. "We all want healthy forests." Zinke expressed optimism that American ingenuity would help reduce future damages from wildfires. "There's a lot of reasons why these catastrophic fires are happening, but certainly we're very clever as Americans, and we need to pull together and do everything within our power to make sure that these communities like Whiskeytown, like Yosemite, like Paradise don't get devastated," he said. Brown was less sanguine. "It's not one thing. It's people; it's how people live; it's where they live, and it's the changing climate, the drought, the diminishing moisture and all the rest of the things we've talked about," he said. "And the truth is — and I don't want to give you any happy-time news — we're going to have more difficulties. Things are not going to get better; they're going to get more challenging because of the continuing alteration of the climate, lack of moisture, early snowmelt and faster winds. The whole thing." Brown also steered clear of pointing fingers on the state level, declining to answer questions about the potential role of utility Pacific Gas & Electric Co., which has been found to have played a role in previous fires and whose stock price dropped by a third after officials disclosed a nearby power outage shortly before the fire started. "I'm not going to comment on issues that touch on liability," he said. "I think it would not be prudent for me to start offering commentary on difficult issues that we have a process to flesh out."